Description: Proportion of palliative care patients who were screened for dyspnea during the palliative care initial encounter. 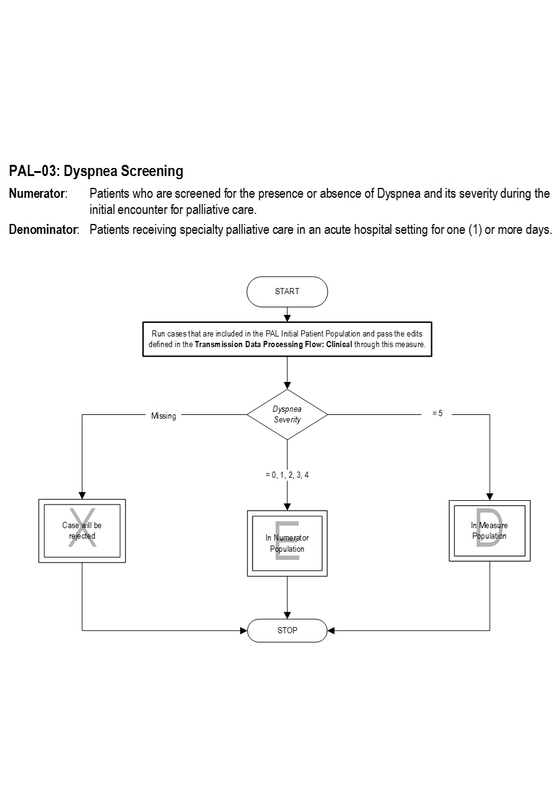 Numerator Statement: Patients who are screened for the presence or absence of Dyspnea and its severity during the initial encounter for palliative care. Data Collection Approach: Retrospective data sources for required data elements include administrative data and medical records. Some hospitals may prefer to gather data concurrently by identifying patients in the population of interest. This approach provides opportunities for improvement at the point of care/service. However, complete documentation includes the principal or other ICD-10CM/PCS diagnosis and procedure codes, which require retrospective data entry. Data Accuracy: Variation may exist in the assignment of ICD-10CM/PCS codes; therefore, coding practices may require evaluation to ensure consistency. Bausewin C, Booth S, Gysels M et al. Non-pharmacologic interventions for breathlessness in advanced stages of malignant and nonmalignant diseases. Cochrane Database Syst Rev 2009. Apr 16; 2:CD005623. Ben-Aharon I, Gafter-Gvili A, Paul M et al. Interventions for alleviating cancer-related dyspnea: a systematic review. J Clin Oncol 2008; 26:2396-2404. Currow DC, Ward AM, Abernethy AP. Advances in the pharmacologic management of breathlessness. Current Opin Supp Pall Care 2009; 3:103-106. Dy SM, Lorenz KA, Naeim A et al. Evidence-based recommendations for cancer fatigue, anorexia, depression and dyspnea. J Clin Onc 2008; 26:3886-3895. Lorenz KA, Lynn J, Dy SM et al. Evidence for improving palliative care at the end of life: a systematic review. Ann Intern Med 2008; 148:147-159. Luce JM, Luce JA. Management of dyspnea in patients with far-advanced lung disease. JAMA 2001; 285:1331-1337. Roberts DK, Thorne SE, Pearson C. Cancer Nurs 1993; 16:310-320.